Don’t you find it frustrating every time you join a new project to find out you have only been provided with a pose library or worse, blend shapes that only contain random mouth shapes? Haven’t people ever seen the Preston Blair book? Let’s make poorly thought out mouth shapes history! 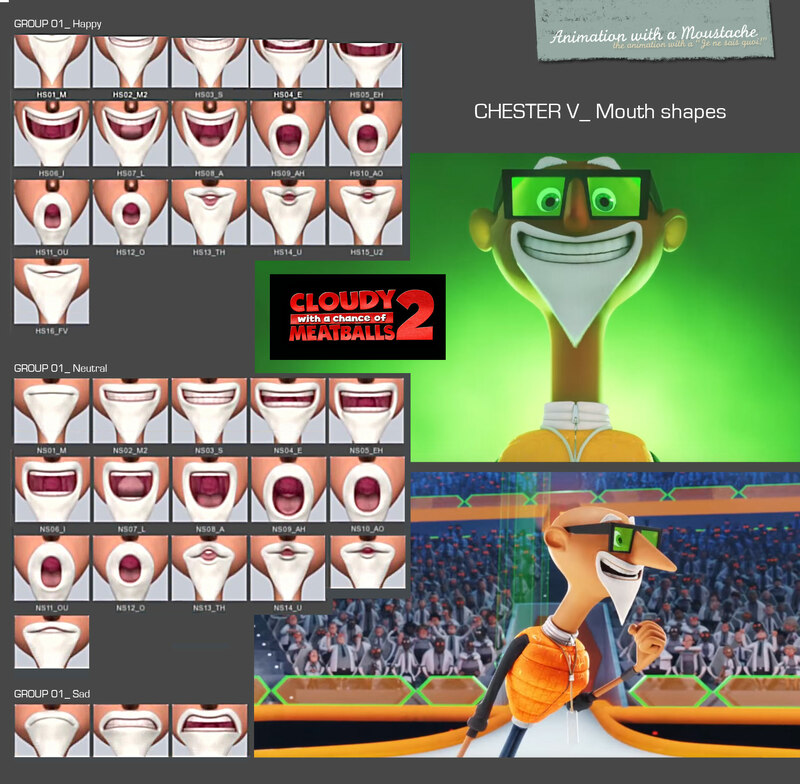 Today I was doing a bit of cartoony animation research and came across that very enjoyable “Cloudy with a chance of Meatballs 2” behind the scene video featuring Chester V.
The camera panned very quickly through Chester V’s mouth shape library but it gave me enough frames to reverse engineer it and make a nice pose library you should share with your modeler and rigger next time you get involved in pre-production. Sorry we couldn’t see the last mouth shapes but you get the idea. On a side note, ideally those shouldn’t be blend shapes but shapes the mouth rig and controls allow you to create and smoothly transition from and out of to the next shapes. Simple per phonem blend shapes don’t allow for smooth transition and should be reserved for low cost animated tv series. As you can see, the mouth shapes are divided in 3 emotions or groups: Happy, Neutral and Sad where the corners move vertically in conjunction with the teeth corners and for each emotion the animators are provided with 16 shapes derived from the Preston Blair simplified phonems: M(BP), S(DTNXK), E, I, L, A, O, TH, U(Q), and F(V). So you want to be a rigger huh? Cool video. However, I am going to guess that what we are seeing is NOT a rigging blendshape library, but rather a collection of animation face poses (combinations of blendshapes and controller poses) that the animators would use to quickly lay out animation. This is why you are seeing groups of faces that are grouped by emotion. But in fact, the smile shapes (for example) would be separate shapes, independent of the mouth shapes, so that you can combine them into all the poses we are seeing in their library. The rigging blendshapes would be more atomic, designed to be combined with each other into poses. I do not recommend modelling shapes based on what you see in these groups. Exactly Chris. That’s why I used the term “Mouth shapes” rather than blend shapes. This is funny to see. I worked on the film and lead animator Tim Pixton gave the animators a talk on his Preston Blair approach to lip sync. I’m really impressed you’ve figured this out form the video. hehe thanks Brendan, yeah lately I have been trying to think how cartoon and realistic animation should differ and mouth shape stylisation is a very important differentiating factor to me, especially at a time when animation schools rely heavily on video reference and rotoscoping.